During the 2012 USAH Annual Congress Meeting, the USAH Board of Directors unanimously endorsed the USAH SafeSport Program. 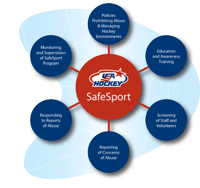 The safety of USAH participants is paramount, and the SafeSport Program is focused on creating an environment that will deter abusers and assist those in the hockey community in recognizing, reducing, and responding to allegations of suspected abuse and misconduct both on and off the ice. players’ increased awareness and respect for the “team concept” in an effort to build and/or strengthen a positive team culture. The Houston Wild USAH SafeSport Program Representative will serve as the initial point of contact for Houston Wild members reporting abuse, misconduct, or other violations as outlined in the USAH SafeSport Program. By clicking on the above USAH SafeSport image, you may access the USAH SafeSport Program to navigate through key areas and view supporting links and downloads/documentation. Visit HERE to access a USAH SafeSport Report Form. Further, in support of and supplemental to those policies set forth in the USAH SafeSport Program, the Houston Wild endorses the following/below policies and reaches out to our Houston Wild parents, coaches, players, and volunteers to support these efforts as a means to provide and ensure a safe and positive environment for our players. (as may be amended from time to time at the discretion of the Board). TAHA Affiliate SafeSport Program Coordinator – John McManaman, 940-733-0215. With the start of the 2018-19 season nearly upon us, the Wild Board looks to all Houston Wild coaches, players, and parents, and the Texas hockey community in general, to distribute, encourage, and implement the USA Hockey Zero Tolerance Policy. Thanks for everyone’s continued commitment in this regard.